You’re in the restroom before a big job interview. You remember reading this blog and you decide to do Megaplank on the wall. You feel your serratus anterior responding, but you also begin to feel your anxiety decreasing and your sense of personal power on the rise. Read on to find your serratus anterior and feel like a superhero at your next job interview! First, a little about me. At the age of 50, after about 22 years as an English professor, the constant keyboard work and talking on the telephone (remember those?) had just about wrecked the right side of my body. My right shoulder was frozen – or so I was told. I had alternating numbness and sharp shooting pains running down my arm. It was just about that time when I started yoga and began learning how to heal my body. Around that time, I happened to meet an old-time baseball pitcher named Steve Rogers and I figured that nobody would know better than a baseball pitcher how to take care of a hurt shoulder. He looked down at me and with a soft, southern drawl, he said, “Sweetheart, you jus’ gotta rehab around that injury.” At that moment, I had no idea what he meant, but now, years later, my shoulder is strong, supple, and flexible and I learned a valuable lesson. Get to know your serratus anterior to keep your scapula in place. The key muscle that helped me to heal my shoulder – the serratus anterior – isn’t technically a shoulder muscle. But as I became aware of the role of this important, but under-appreciated muscle, I learned an important lesson of body mechanics. That is, when one muscle or set of muscles are injured or weak or overstretched they will recruit help from surrounding muscles and that is often the source of pain. On the other hand, when we strengthen postural muscles, such as the serratus anterior, we provide support for those weak or overstretched or injured muscles. Strengthening my serratus anterior allowed my weak and injured shoulder muscles to heal while offering much-needed support. The serratus anterior, as Biel’s Trail Guide to the Body attests, is always well-developed on superheroes. However, on the rest of us, this muscle can be hard to find. It is a flat, serrated, oblique muscle that begins from the superior border of the upper nine ribs and extends underneath the scapula. The serratus anterior’s claim to fame is that it can abduct (or protract) the scapula, which means it can draw the scapula away from the midline of the body. The serratus anterior is partially covered by the breast. This muscle that has so much real estate from the scapula, around the sides of our ribs and even underneath our breasts that is becomes hugely important in stabilizing the upper core, whether you are throwing a punch or just pushing open a heavy revolving door. First, let’s find this muscle. Extend your right arm in front of you at shoulder height and flex your elbow to 90 degrees. Press the right forearm and right palm into the wall as though you expect the wall to press back. 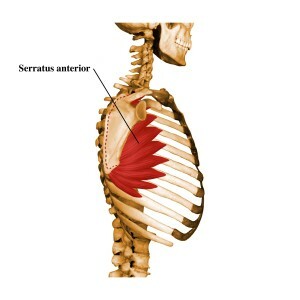 As your right scapula protracts, you’ll feel an isometric meetup in which the serratus anterior turns on just a little and chirps “hello.” Do this again with the left hand and notice any difference between the sides of your body. Come back Friday to learn more about activating and strengthening your serratus anterior (and possibly becoming a superhero)! Thanks for your great article! It really makes sense to fire up the lazy muscle to help heal the over worked ones. I’ve been doing a lot of mega planks to get my serratus working. Superhero in the making! Secret shortcut to being a superhero, thanks! I have a hard time propriocepting the scapula, so I’m hoping that spending some time getting to know the serratus will help me to isolate that protract and retract motion. So glad I found that muscle… think I finally got the answer for my shoulder problems. This explanation of Mega Plank and Serratus Anterior is incredibly useful. It helped me and I know it will help my students!!! Thanks! Liked “the find the muscle” very much! Good intro to the serratus anterior muscle. I didn’t have a clue about this muscle until a few days ago. Also good emphasis on explaining that a weak area of muscles will steal from the stronger areas, which is how we become unbalanced and open for injury. I look forward to more from you and really celebrate someone taking charge of their health at age 50! Such great detail on this superhero muscle! So important for core strength and shoulder stability. Thanks for sharing! Thank you so much for explaining the importance of the serratus anterior and pointing out to shift the focus on the surrounding muscles when working on healing an injury or weakness! I can attest that this is an often forgotten concept!! I had no idea that I had one of these until recently and I still didn’t get that it wrapped to the front under the pecs. I definitely want to be a super hero and I love feeling positive and strong so Serratus anterior is my new friend. the most important piece is that we have ways to access well being and strength that we were never taught about. this is exciting. Thank you for your walk through of megaplank on the wall- its an accessible way to get people to discover their serratus anterior before taking it to the next level in their megaplank on the mat. Will remember this as I work on general shoulder stability, thanks! Discovered today with interest that there could be a cure to my chronic – computer lifestyle induced – protracted shoulders so this blog was timely to drive in some key concepts. Thanks for the post. This feels so good! Even after years of classical ballet training, I find myself with poor posture and a nagging shoulder injury. This mega plank at the wall instantaneously reminded me of my postural issues (and corrections needed) and relieved the nagging pain in my shoulder. I feel like a super hero! Thank you for explaining everything that the serrated anterior does. I knew it protracted the shoulders but was unaware of its ability to stabilize the upper core. This helps me to understand why it’s an important muscle used in jumping back and forward between downward facing dog and seated poses. I love the idea of the serratus being connected to your power! From my perspective of Laban Movement analysis we have a quality of shape referring to Narrowing and Widening. When activating the serratus we feel a widening of the ribcage even after the exercise is over as the muscles takes up physical space! This could totally help me feel more powerful as my intimated, narrow self felt the widening and empowerment of my body in space. This comes back to body language as well! I am perceived more confident with a wider sense of self. Thank you for the great tip about how to “find” or feel the serratus anterior. I noticed the right side is much weaker than my left, and I had a “frozen shoulder” on that side. Now I’m thinking that perhaps I’ve found a contributing factor. So cool! The more I learn about this muscle the more I want to know. I just finished YTU level 1 and learned more about SA and how to drag my arms toward my feet ( figuratively) while in plank to access it more fully. Great post. Everyone notices immediately when they ‘wake up’ their serratus anterior by engaging it in a plank, and the wall version is a great option for people who may lack strength to do the plank version. Tanks you to remember me how the serratus anterior is an important muscle. He’s a superhero like you said. I’m a therapist and most of the time, the serratus anterior is in problem in the shoulder pain. I am totally doing Megaplank next time I go into a big meeting 🙂 Look forward to your next post! Thank you for this post. I am a big fan of this one having had my share of shoulder injuries and somehow avoiding the knife. The Serratus has come to the rescue for me in the past and now with the Yoga Tune Up® Plank with Serratus which I just learned in the Yoga Tune Up® training I can keep them strong. This is great and so helpful! I teach movement to musicians and I notice that they tend to hang the weight of their arms and instruments off their torsos. I think that developing strength and awareness in the serratus anterior is big piece in developing an alternate more efficient and more supportive way to move. I might give them this post to read! Looking forward to checking out part 2. Thanks Ann Marie, I just started my Yoga Tune Up training. Loving it and with this post my listening for the serratus anterior will be heightened! I never knew this muscle existed! That little exercise you mentioned above already made me realize how weak and underdeveloped this muscle is on my own body. Hi AnnMerle! I’m a fellow Forrest Yoga/Yoga Tune Up teacher. I really appreciate your illumination of the Serratus Anterior. I heard the word so many times during my teacher trainings but never knew where it was, what it did, and the “why” behind its importance. I’m so grateful for this anatomy-based, functional knowledge that helps provide the context and reasons why we want a responsive serratus, especially for the all the fun poses we experiment with in yoga asana. Thanks! hi AnnMerle! I love your post and love that it’s about the good ol’ serratus anterior because of our Turbodog connection. I love your cuing and excited to teach this! Aho!! I love that the serratus anterior is referred as the super hero muscle. It is often overlooked in a lot of shoulder pain. I’m happy you mentioned it’s stabilizing properties as well as it’s synergist actions! Thank you! Article intéressant sur le lien entre le renforcissement du serratus anterior et la connection du haut du tronc ! Thank you! I talk about the SA often, I will use this cue to help people locate and isolate! Awesome article! The serratus anterior is often underused. Great reminder to reinforce it! Thank you for this insight AnnMerle!! Great article, can’t wait for the next one! Awesome article Annamerle! I will post it in my yoga Facebook page. I’ll make sure to incorporate some planks at the wall from now on ??? Awesome can hardly wait for next week!